The new HiPace 700 H turbopump is designed for research and analytics' applications and for other industrial applications. Pfeiffer Vacuum has announced the introduction of its HiPace 700 H turbopumps, which offer very high compression, especially for light gases. With a compression ratio of ≥ 2·107for hydrogen, they are designed to generate high and ultra-high vacuum. Due to the high compression ratio, a low residual gas spectrum, which is required for certain mass spectrometry applications, is created in the chamber. The company says that HiPace 700 H turbopumps have a very high critical backing pressure capability of 22 hPa because of their advanced rotor designs. 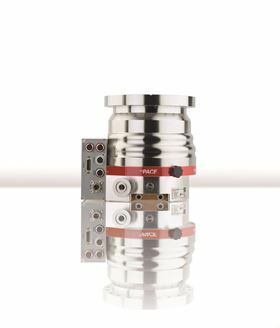 This allows the pumps to reach ultra-high vacuum, even when operating with high backing pressures that occur in combination with diaphragm pumps. Mr Henss added that the pumps feature an integrated intermittent mode function ensures that it switches a connected backing pump on only if the backing pressure is no longer sufficient. This reduces the energy consumption of the entire vacuum system by up to 90%.